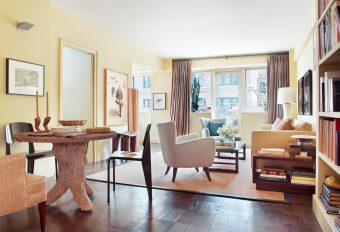 One of our earliest clients, a New York-based couple, had their first apartment decorated by Thomas Jayne in the 1990s and looked again to his firm to help make a transition to their new dream apartment near Central Park. 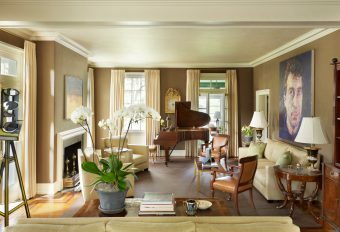 Working with architect Peter Pennoyer, he created a stylish new setting to present some of their earlier collections, along with new acquisitions that reflected their personal and family histories and interests. The ethos of the apartment is announced with the 1893 French portrait of our client’s great grandmother, rescued from storage and hung on a wall hand-painted by artist Ann Harris to mimic the background in the picture. The painting is hung above an 19th-century marble-topped console. 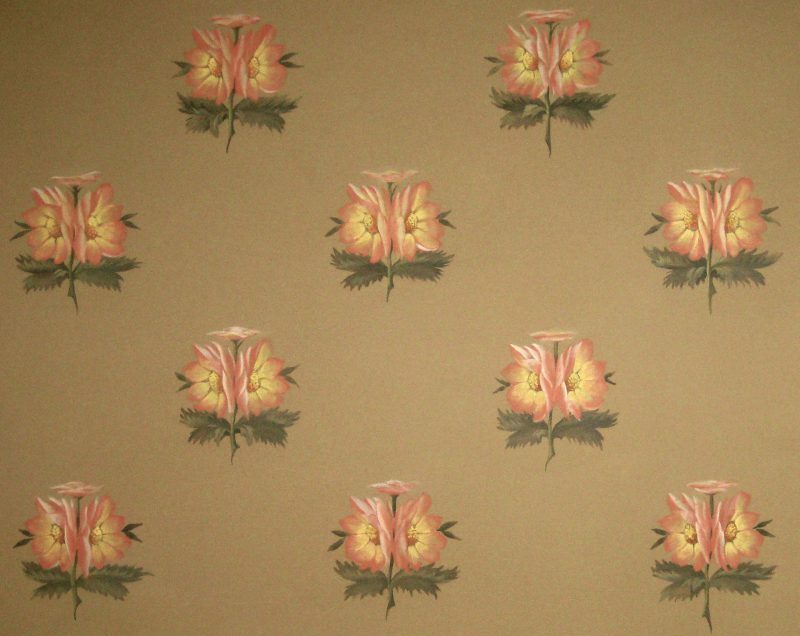 Ann Harris’ precise recreation of the late 19th century wallpaper pattern creates an effortless continuum between painting and wall. Our clients are well-informed collectors with a keen eye. 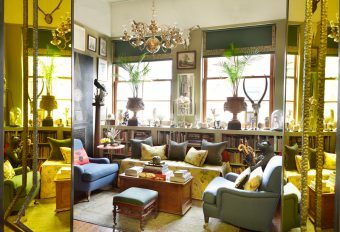 The living room features a combination of European and Asian antiques that reflect their sophisticated taste. 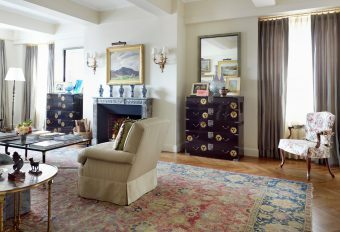 The decoration plays off the mixture of textures and materials, which include a set of Chinese export garniture on the mantel, a pair of Japanese black lacquer chests, an important antique Isfahan carpet, and a Library chair by Thomas Chippendale. 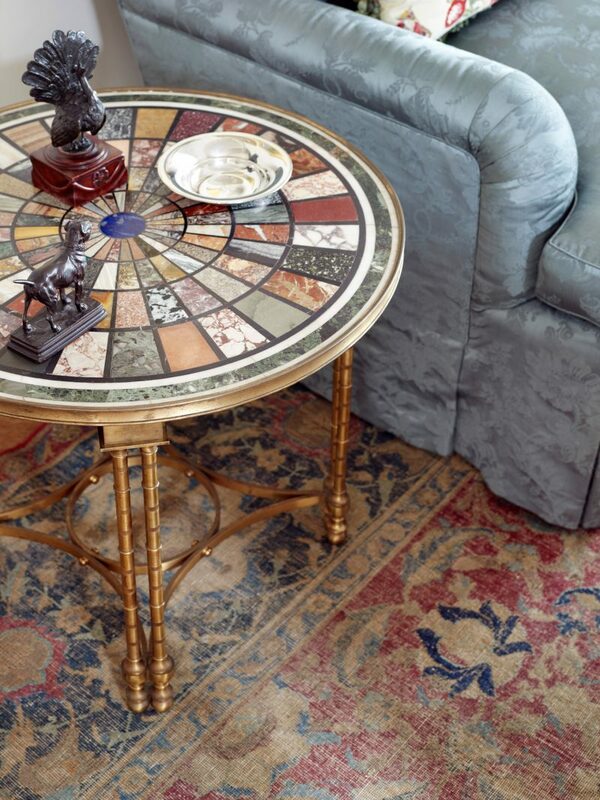 A section of the living room highlights some of the richly textured objects to be found throughout –a weathered 17th-century Isfahan carpet, a marble specimen top table, and silk damask sofa. 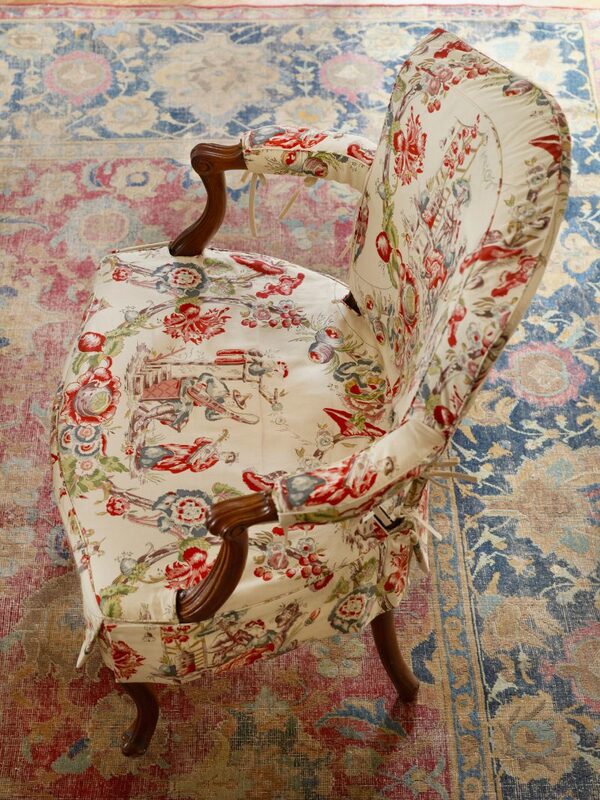 The client’s English chair is slipcovered in an exuberant chinoiserie pattern that adds further interest and contrast to the scheme. Small details enrich the decoration. 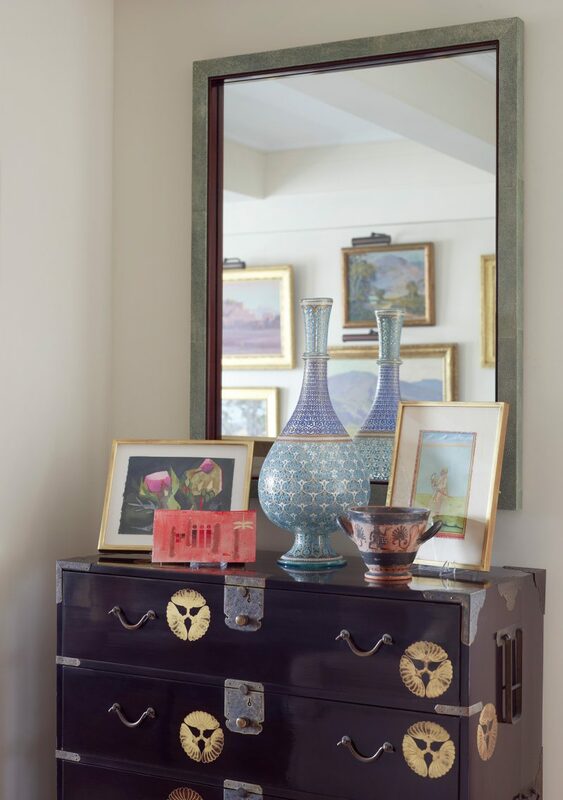 An area by the fireplace holds a Japanese chest topped with Grecian and Islamic pottery and small contemporary watercolors. 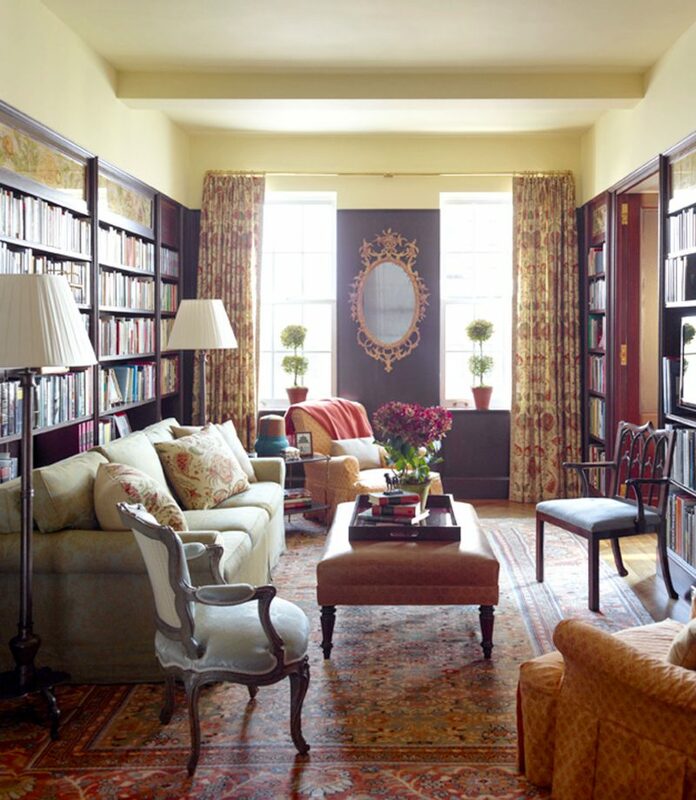 The handsome library is comfortably arranged for reading, TV watching, and relaxing. The bookcases and walls are a rich wood that give the room a warm and welcoming feel. As counterbalance, light colors and subtly textured fabrics are used for the curtains and upholstery, and a giltwood mirror and églomisé panels at the tops of the bookcases add a subtle shimmer. 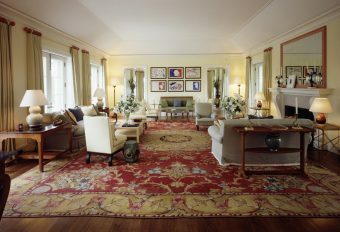 The library’s textile selections ally with the colors in the antique carpet. 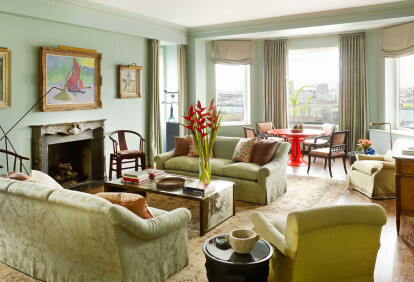 A printed linen is used for the curtains and a green woven damask on the sofa. The ottoman is covered in a pale pink gaufraged leather and the chair and ottoman have matching slipcovers made from a Fortuny print. 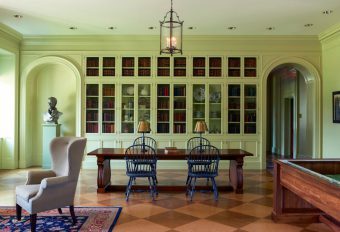 The bookcases are topped with glass panel insets of verre églomisé executed by master artist Miriam Ellner. The panels are reverse-painted in 22-karat gold leaf and show a series of commodities such as cocoa, coffee, wheat, cotton, peanuts, and tropical fruits, which our client trades in his work. A detail of the library’s églomisé panel shows cocoa pods and palm fruit. Miriam drew upon historical engraving and prints to create the paintings. 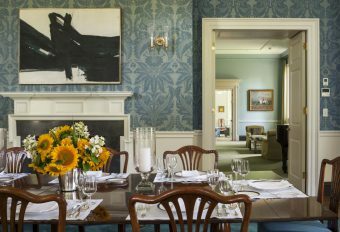 The dining room is painted an uplifting shade of blue and features a set of painted wheel-back armchairs by Gillows of Lancaster that give the room its special character. 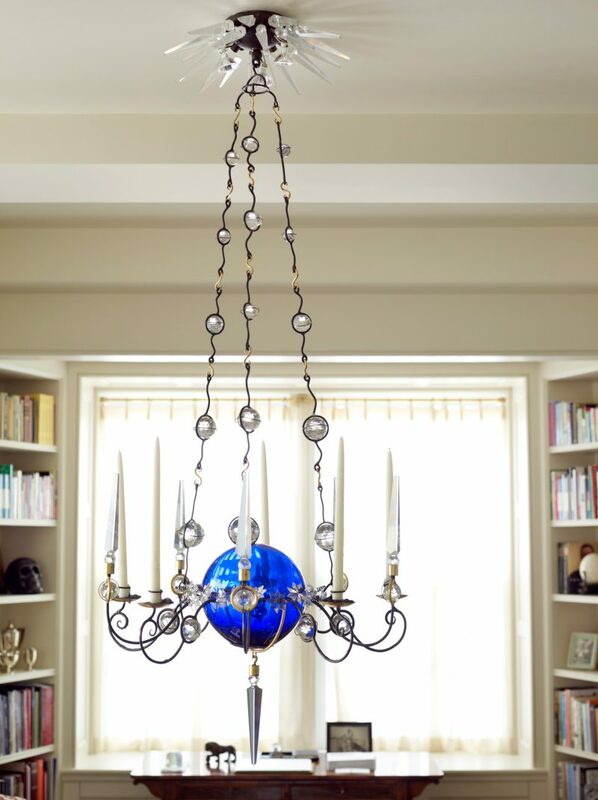 A unique contemporary chandelier by Bob Russell was originally commissioned for the client’s first apartment and becomes the focus of their new dining room. 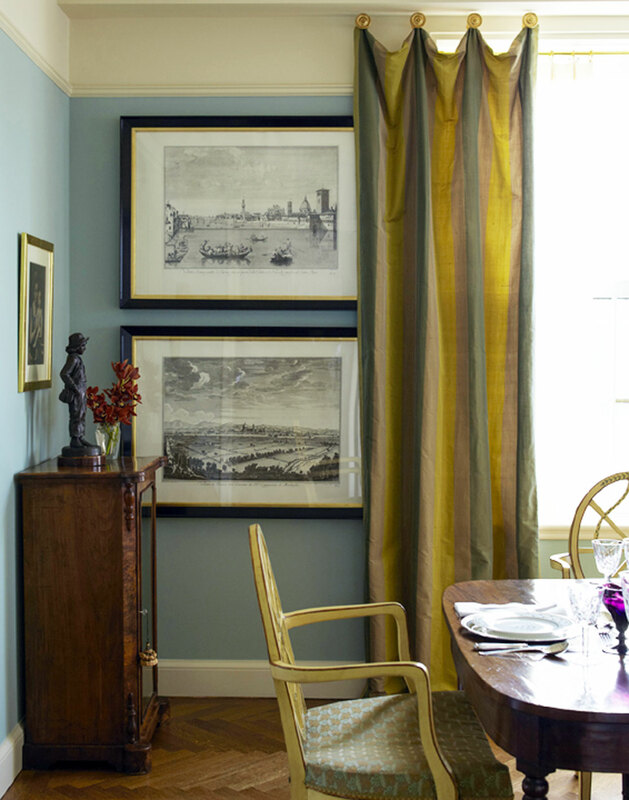 The dining room curtains are made of striped silk hung from rosettes, a traditional alternative to hanging with rods. 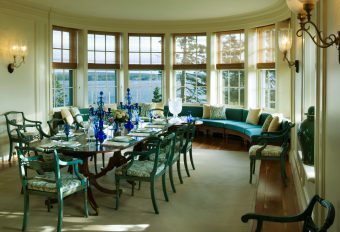 While the curtains do not draw or move, they add architectural detail and elegance to the room. The chandelier by Bob Russell is a combination of crystal spheres and stars, and like much of the artist’s work, it whimsically evokes celestial and heavenly objects. 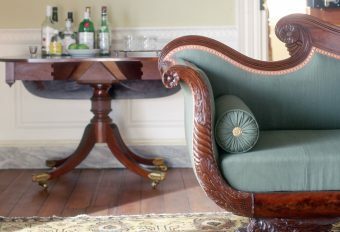 The dining chairs are beautifully detailed and exhibit a high level of artistry and craftsmanship. 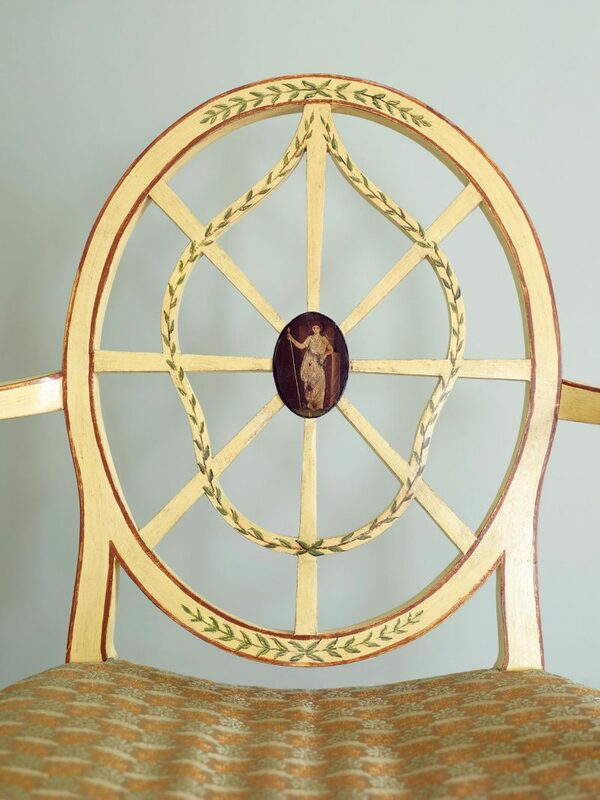 Each chair is uniquely decorated with ladies in Grecian dress and a hand-painted olive branch decoration meandering through the spokes. The entry foyer is symmetrically arranged with a set of Regency hall chairs and a striking pair of archangel paintings from the Cuzco school, an artistic tradition centered in Peru from the 16th to 18th centuries. The opposite view of the entry hall leads to the library. 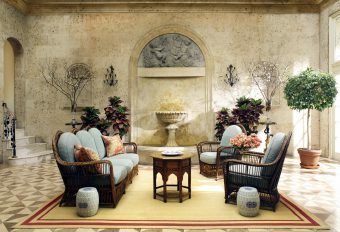 The door is framed with the same set of Regency hall chairs with a pair of chinoiserie-style sconces placed above them. The sconces were made by maker E. F. Caldwell in 1920s and are contemporary to the building. The symmetrical arrangement mirrors the opposite view of the entry and sets an ordered tone for the flow of rooms to follow. The bedroom has a René Lalique Charmes chandelier with a molded-glass base decorated with Art Deco motifs and drawings from the client’s collection decorate the walls.